A black and white negative of Reverend Douglas B. Langford standing on the porch of the St. John's Church Rectory. Reverend Douglas B. Langford was born in India on January 25, 1878. After his marriage he came to Toronto, Canada, as Vicar of Little Trinity Church. 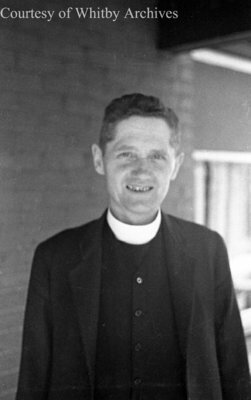 From 1924 to 1948 he was Rector of St. John's Anglican Church at Port Whitby. He died at Toronto on December 7, 1949, and is buried in St. John's Anglican Cemetery, Port Whitby. Ruddy, Marjorie Georgina ; Langford, Reverend Douglas B.
Reverend Douglas B. Langford, c.1931, Marjorie Ruddy. Whitby Archives A2013_040_020A.